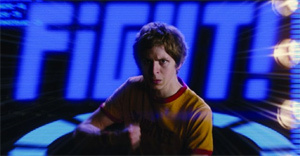 Scott Pilgrim is the latest incarnation of supernerd Michael Cera. At least this Scott Pilgrim is 22 — not a teenager — and he’s not hopelessly geeky, in spite of his casting. He plays in a band that isn’t very bad, and he acquires two (count ‘em) girlfriends in the first few minutes of screen time. Still, with Cera in the lead, you know roughly what kind of movie this is going to be: a coming-of-age story for those at the bottom of the cool totem pole. Those of us not hip to the Scott Pilgrim comic books might be forgiven for thinking the movie will one of those battle-of-the-bands movies. The poster shows Cera jamming on an electric bass. But the key word in the title is “vs.” — Scott Pilgrim may jam, but the dominant influence in Scott Pilgrim vs. the World is not music but combat video games. Visually, the movie jumps off the screen. Director Edgar Wright (Shaun of the Dead) starts working his restless video-game style right away with jarring, funny jump cuts that get us through the exposition quickly and painlessly. Every little conflict in Scott’s life is a battle to the death, every minor victory is an explosion of points and coins, and every boring plot point is established with funny omniscient shortcuts. All of this contrasts cleverly, of course, with the smaller-than-life casting of Cera as the squeaky-voiced hero. What fails to leap off the screen is the story. In order to keep dating Ramona Flowers (Mary Elizabeth Winstead), Scott has to come to terms with her impure past. But since hardships are larger than life, the movie puts it this way: Scott has to defeat Ramona’s seven evil exes in hand-to-hand combat, including Todd the bass player with vegan superpowers. In support is Scott’s casually gay roommate Wallace (Kieran Culkin), who offers generally good advice but delights in tormenting Scott by calling Scott’s sister Stacey (Anna Kendrick) and letting her torture him with bad advice. Scott Pilgrim thinks it has found redeeming social importance in all those video games we men of a certain age used to play. Street Fighter II wasn’t just a vacuum for quarters and an excuse to ignore homework and human interaction... it taught us that you have to fight for what you want. Frankly I didn’t expect much from this predictable-looking teenage romantic comedy. But Wright’s style gives it an extra kick and keeps it from being too cloying. That there’s a message — even at a stretch — is icing on the... er, is an extra life.